A welcoming place to stay in the beautiful Napa Valley, just a few minutes from Downtown Napa and the Wine Train Station, where your elegant train journey with multi-course gourmet lunch takes flight. From there, you decide. Retreat to the sanctuary of the Hilton Garden Inn, or explore the stunning landscape on two wheels, at your own pace. To book, call the Hilton Garden Inn. 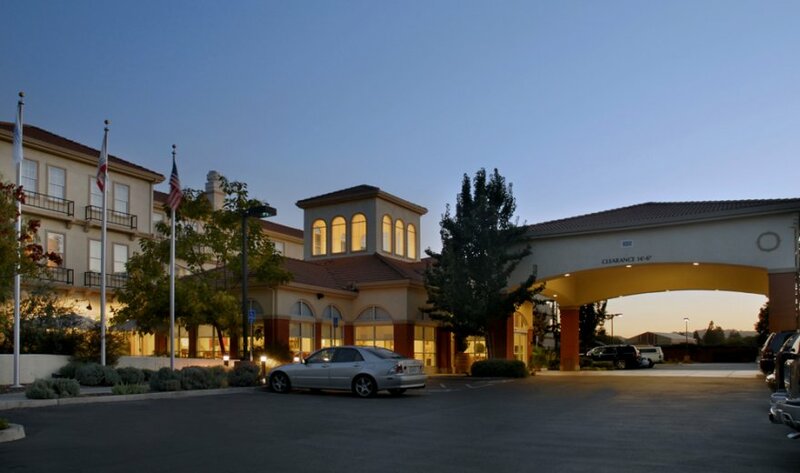 The Hilton Garden Inn Napa is comfortable and friendly, welcoming and relaxed. And just a few minutes from lively Downtown Napa and the historical waterfront. First enjoy a multiple course gourmet lunch on board the luxurious and elegant Napa Valley Wine Train. After your delightful journey through Napa Valley’s beautiful mountain scenery and lush vineyards, use your “Taste of the Valley” pass to get two-for-one tastings at select wineries. Or enjoy the sanctuary of your home base and its heated pool and spa, fitness center, wine bar and tasting lounge, outdoor fire pit, or a glorious spa treatment from the comfort of your own room. Prefer to keep exploring? Grab a bike rental and pedal your way through the Valley to the quaint historic towns of Yountville and Napa, roll along the winding Napa River, or visit the many wineries that are within minutes of the hotel thanks to the Vine Trail, the car-free bike path located directly across the street from the hotel. The Hilton Garden Inn offers excellent service and spacious guestrooms. Feel at home with complimentary Wi-Fi, 42-inch HDTV with Direct TV channels, refrigerators, microwaves, coffeemakers and large work desks with adjustable lighting and ergonomic chairs. Some suites offer whirlpool and accessible rooms are available. Keep fit and exercise in our Precor® fitness center or swim in the heated outdoor pool and relax in the whirlpool spa. *The package price may not be available on specific days, like holidays. The gratuity and hotel taxes are not included in the price of the package. A two-night minimum might apply. Please contact the Hilton Garden Inn for complete details.